Choosing the best steering wheel covers is never an easy task. There are many things to consider, from how the cover fits around your wheel and around the cruise and other controls to the comfort, design and durability of the wheel cover. 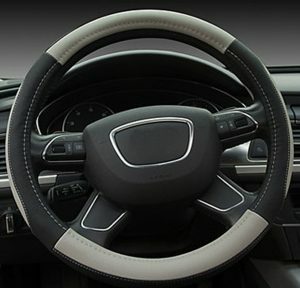 But we’ve narrowed down the huge selection of steering wheel covers to just three, allowing for tight budgets and giving you the best value for your money, using the manufacturer’s specifications, steering wheel covers reviews and more, so that you can make a great choice for your next purchase. Let’s briefly discuss the top three wheel covers and then cover them more in-depth a little later. This is considered by us the best steering wheel cover on the market! The GoMass Embossed Top Leather Steering Wheel Cover is our top overall pick because of the quality of the construction materials, the sleek design and the customer reviews that show this to be an almost perfect product. This steering wheel cover combines black with a deep red for a beautiful color combination that instantly adds value to your vehicle. The material that makes up this wheel cover is smooth and sleek bi-cast leather, with a rubber interior ring and a gorgeous embossed design. This steering wheel cover is standard size to fit 14.5 to 15-inch steering wheels and it is easy to install. Another reason that we chose this steering wheel cover to be the top choice of all of the ones we examined is that it comes with a lifetime guarantee with no questions asked. This is a rarity among any product, and steering wheels are no exception. This is a great choice if you are looking for a top quality product. If you are looking for the steering wheel that gives you the best bang for your buck – and has the most features, the highest quality and the most stylish design with the price being factored in, then your choice should be the SEG Direct Black and Gray Microfiber Leather cover. This cover is nearly as good as the top overall pick but for a much more budget-friendly price. Features like heat resistance and skid resistance are some of the best things about this option and it fits 15 inch steering wheels. Don’t think that you’ll be compromising quality or style either, just because you are getting a good value for your money. This is actually a very good looking steering wheel and is quite sleek and stylish with eight amazing color schemes including red and black, blue and black and pure black. You can protect your steering wheel and give you a better grip, plus make your interior look better while still saving money on a wheel cover. Finally, the third steering wheel cover that we’ll discuss is the best cover for those who are on a tight budget and want to save some money but still get a great wheel cover. The best budget wheel cover is the Mayco Bell Car Steering Wheel Cover. This is a very high-quality wheel cover and one that fits 15” wheels as well as those that are 14.5”. It is polyurethane-lined leather, and is very stylish considering it is the best steering wheel cover on a budget. There are seven different color combinations and all of them are about the same price, although there are some that are a much lower price point. Mayco Bell is a solid company that has experience making great wheel covers and the reviews in this case have been excellent – especially for a budget wheel cover. This cover is designed with comfort in mind on the outside and safety on the inside, with a non-skid surface that makes it a good investment for your vehicle. Steering wheel covers are one of the best investments that you can make for your car. First of all, they are stylish and look great, which immediately adds value to your car. If you are planning to sell your vehicle at a later point, then an investment in a steering wheel cover now could pay off down the road. A wheel cover could allow you to sell your vehicle for hundreds more down the road, especially combined with seat covers, car seat cushions or other accessories. But an investment in your vehicle isn’t the only reason to get a seat cover. There are the comfort and safety factors as well. Steering wheel covers can make it easier to drive long distances and be comfortable while gripping the wheel. It also gives you better control and handling and the chances of your hands slipping off the wheel at a vital moment are much reduced with a wheel cover. There are lots of great reasons to invest in a wheel cover for your car and you get to choose your color and design so you are adding a splash of your own personality as well. There are definitely a few things that make a great steering wheel cover. These are the factors that you will be looking for as you shop for wheel covers and that you will be deciding beforehand to narrow down the search. Of course, the steering wheel covers presented here are the best that we could find, and they are an easy choice if they fit and you like the design. The first thing that you’ll want to look at is the size of the steering wheel cover. Unfortunately, this is the one non-negotiable part of the shopping process for steering wheel covers. You can choose between different designs, materials and other aspects, but if you don’t get a wheel cover that fits your steering wheel exactly, then you might as well not have one. It isn’t safe and it won’t be comfortable to drive with. 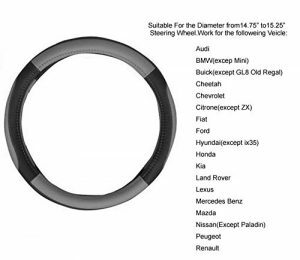 To find out the size of your steering wheel, you can either check your manufacturer specifications or measure the diameter manually starting with the outside edges. You can also purchase a steering wheel that is specifically made for your make and model and vehicle year. You also need to be concerned about the material of the wheel cover. One of the most widely used materials in wheel covers is leather or PU (polyurethane) lined leather. This is also known as bi-cast leather. Leather is a great material but it does require occasional maintenance and cleaning. You can also get wheel covers made of fabric, faux wood steering wheel covers and even high-quality rubber. 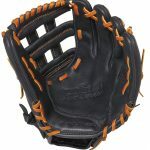 Synthetic mesh is also popular, particularly with buyers that are mostly concerned about grip. If you drive a great deal in the colder months, consider a heated steering wheel cover. Speaking of grip, it is definitely one of the things that you should be considering as you shop for wheel covers. You want your steering wheel cover to first and foremost allow you to have a good grip on the steering wheel. You can find a design that you will like because there are hundreds of thousands of them available, but only after you find a grip that you like. Make sure that you test out the wheel cover to see if it allows you all the control of your car that you need, particularly with synthetic covers, which need ridges or mesh to provide the right amount of grip. Finally, you want to choose a style and a color scheme that you like. While this is definitely the most fun part, it should be last, after you have found a wheel that fits and gives you a good grip and chosen the material that your wheel cover is going to be made of. There are lots of styles and colors, even among the top choices that we have been discussing here. The GoMass leather steering wheel cover is our top overall pick for a lot of reasons. First of all, this steering wheel cover is stylish and it offers amazing grip and a perfect combination of leather and polyurethane lining for maximum durability and control. This product goes really fast so you’ll want to get one as quick as you can – and it’s no wonder why. You get the highest quality wheel cover at a price you can live with. Let’s start with some of the features of this steering wheel cover. This is a very durable polyurethane lined leather material that the wheel cover is made from. It is beautiful to look out and amazing to touch. 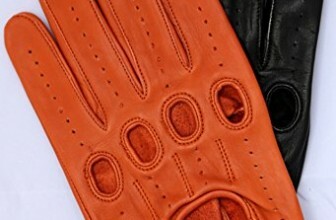 The pattern on the leather shows the quality of the wheel and the stitching and seams are both perfect. This is also a wheel cover that is more versatile than some of the others out there. This wheel cover will perfectly fit 15” steering wheels as well as 14.5” steering wheels. Protects your steering wheel with a natural rubber lining that makes the cover grip tight to the steering wheel underneath. 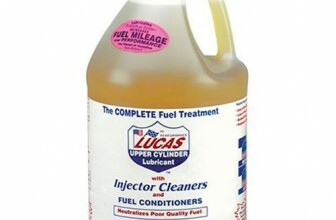 This gives you maximum control even in the toughest of road conditions. One of the easiest installations out there. You can easily install it yourself with no help or at worst, with a little instruction. There are some included accessories with this steering wheel cover that you will love. First of all, it comes with a USB cable for both Apple and Android devices for your car. There is also a wonderful American flag air freshener with every purchase. These are terrific additions to what is already a great product. Easy installation: It takes less than a minute to install the steering wheel cover and if you have trouble, you can easily check an online video and see how it is installed. Protection for your car: When you install a steering wheel cover it means that you are interesting in preserving the original equipment of your vehicle. Comes with a lifetime guarantee: This product is one of the few that comes with an unconditional lifetime satisfaction guarantee – with no questions asked. This steering wheel cover is quite thick compared to what you might be used to. It might be difficult to adapt to if you are used to being able to wrap your fingers all the way around the wheel. Does not come with instructions but it is easy to find YouTube videos of other tutorials online that show you how to install it – still takes only a minute or two to get it on. Customers are saying great things about this steering wheel cover on Amazon. There are several hundred reviews and almost all of them are five stars. There are a couple that are lower – someone rated the wheel cover one star because it didn’t fit their car for example, but for the most part everyone is very happy with the GoMass cover. People comment on how snug it fits, how classy it looks on their car and how great of a grip it offers. These amazing reviews were one of the reasons why this is our top overall pick for steering wheel covers. The SEG Direct microfiber steering wheel cover is our top pick for the money because it is such a high-quality product and has a great price besides. Obviously, if money isn’t a consideration then you might want to go with the top pick, as it is a little higher quality. But the fact is, this is so comparable that most won’t be able to tell the difference. Rather than the polyurethane leather of the GoMass wheel cover, the SEG Direct has microfiber leather which is very soft and supple and looks great besides. Before anything else, let’s talk about the features of this terrific steering wheel cover. 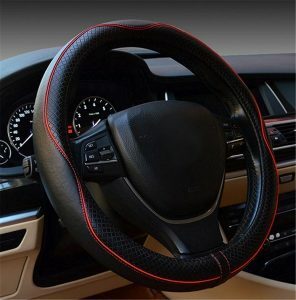 The material: This steering wheel cover Is made of a very smooth, soft and long-lasting microfiber leather. That means that not only does it look great, but it is going to look great for a long time to come. You don’t have to worry about your car heating up and damaging this wheel cover. It is heat resistant. A very skintight fitting cover that is skidproof and gives you a great deal of control over the steering wheel. Fits many of the cars on the market. Measure your car and see if you have a 15” steering wheel. If so, this cover will fit. This wheel cover doesn’t come with any additional accessories, but there are some pretty big savings if you want to combine your SEG Direct products and outfit your car completely. There are major discounting for combining things like seat covers and winter-suitable wheel covers. This is a steering wheel cover with a great fit from SEG Direct. If you have a 15” wheel cover you will find it to be a perfect fit. There are many different makes and models of cars that this steering wheel cover fits. This is a soft wheel cover with padding and breathable mesh. It is contoured to fit your hand perfectly and even has a design that allows for massaging of the hands for driving long distances. This is an extremely durable wheel cover, resistant to both heat and cold and will last for a long time. 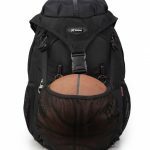 The company believes in doing what they can to help the environment so the materials are eco-friendly. After a lot of driving, some customers have reported it starting to unravel or fall apart. But those who claimed this to be the case were a very small fraction compared to the satisfied customers who rated it five stars. It doesn’t stretch as well as it could which makes it a little harder to get onto your steering wheel. Customers are overwhelmingly happy with this product. There is a reason that it is rated 4.5 stars overall after hundreds of reviews. The customers who have rated it lower make up a fraction of a single percentage compared to the positive reviews and it is probably safe to discount them. The bottom line is that this is an amazing product and that’s why it is our pick for the best value for the money. The top of our list for budget steering wheel covers is the Mayco Bell 15-inch wheel cover. This is a great buy and it goes to show you that you don’t have to compromise on quality just because you are on a budget. This is about half the price of the top wheel cover on the list, but it is still a wonderful product. 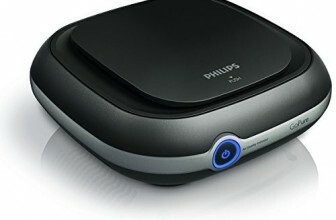 This product is made of microfiber leather combined with polyurethane for the perfect combination of materials. It comes from a great brand that has built a reputation in the industry for coming out with quality products that are priced affordably for everyone. Let’s start with the installation. Unlike the others on this list, the installation on this couldn’t be easier and you aren’t going to need instructions or a video to put it on. It fits any steering wheel from 14.5 inches to 15 inches. If you are measuring in centimeters, your vehicle steering wheel should be around 38 centimeters. Durable and beautiful, made of microfiber lined with polyurethane. Shipping is fast on this product. You can be certain that your steering wheel cover will arrive on time. This doesn’t have any additional accessories that are included with it like the first wheel cover does, but there are some pairing that you can take advantage of if you wish. For example, this wheel cover can be combined with similar floor mats or seat covers. Fits a wide variety of cars with wheels from 14.5 inches to 15 inches. When it comes to what customers are saying, there is a mixed bag here. The majority of the reviews definitely were positive. The steering wheel cover has a total average review of 4.7 stars, which is even better than our number two choice. But there are a larger percentage of negative reviews than with the other covers. Overall though, customers absolutely love this wheel cover and are even more pleased about the price. There are a few more things that you should be aware of when it comes to steering wheel covers. First of all, there are more materials making up steering wheel covers than just the ones that have been discussed here. Some examples include sheepskin and wood grains, which are excellent wheel covers for restored classic cars. You might also want to keep in mind that at first glance, the steering wheel cover probably isn’t going to look like it fits. In fact, you might think that there is no way it will fit on your wheel, but the truth is, it fits perfectly, snug and flush and it’s built that way on purpose. You might also look into accessories that go with steering wheel covers. One of the most popular combinations is a seat cover and matching wheel cover. This can add enormous value to a car and you probably won’t spend more than a hundred or two hundred dollars – depending upon the material that you choose. Other accessories include wheel knobs to make turning easier – especially for those who are disabled – and finally, there are steering wheel locking devices that you might want to consider as well. Another consideration is that some cars are going to be different than others. For example, sports cars have a lower steering ratio than other cars and you will have to allow for that with your steering wheel cover. Also, some older cars might not fit even if they seem to measure correctly because the design of the steering wheel differed considerably with classic cars – especially with restored cars that have the original equipment. When it comes to steering wheel covers there are definitely a lot of choices out there. These wheel covers fit between a 14.5” and 15” steering wheel – in other words just about every mid-sized steering wheel. Choosing one of these three is probably your best bet, as can be shown by the hundreds of five-star reviews, but if you want to go with a different wheel cover, make sure that you look at the size first, then decide upon the material that you want, make sure the grip is secure and then choose your design colors or styles. That way, you’ll end up with the perfect steering wheel cover every time.